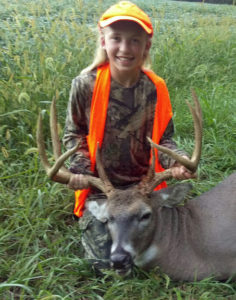 Deer Firearms hunting references modern rifle (Missouri and Kansas) and shotgun (Iowa) deer hunting. 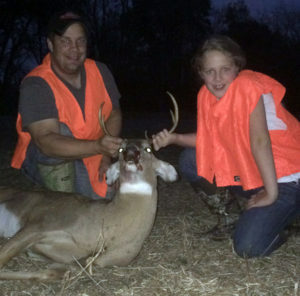 Muzzleloader and Archery deer hunting are covered in their separate sections. Firearms have obvious advantage of long range shooting. All three of our states will allow hunter observation at longer range than most will be able to shoot accurately. In general terms central and western Kansas will easily allow 300+ yard shots over open ground clean of trees and brush. Eastern Kansas, Missouri and Iowa will allow shooting from 10 yards to the limit of the ridge line, wooded fence row or creek bottom that may extend beyond 300 yards. However, frequently will be less. While Kansas’ open ground can well make use of a high power scope, those in Iowa and Missouri will be well fitted to have a variable up to 7 or 9 power. This may seem obvious or elementary to any hunter. Our motivation for writing it is for all have such a good hunt they will want to return for years of whitetail hunts to come. This is especially true for first time central midwest hunters. 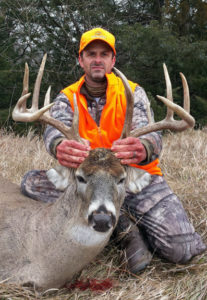 What may be news to more than a casual reader is open ground shooting frequently has a hunter shooting under a trophy whitetail of a lifetime. Cause for this is it is more difficult to estimate range across open ground than of closed in terrain. More so for those who travel from big woods home states. States of tight terrain where typically any deer seen is well under 100 yards. Combined with the 100 yard shooting range the most common long range available. Together both inhibit extended range accuracy required by our open ground. This all conspires for many hunters to be excellent 100 yard and under shooters. However, when out on Kansas’ big open of the great plains what appears to be a close range is typically a lot farther out. That visual acuity to accurately estimate ranges beyond 100 yards is lacking in anyone not routinely engaging such targets. The best of whom are coyote and groundhog hunters. The rest of us simply are lacking the irreplaceable experience of being able to engage any target beyond that which we do routinely shoot. Perhaps a related deer hunting discipline may add weight to this firearms hunter dilemma. The archery deer hunter is 40 yards and under. The archery hunter can routinely practice multiple iterations under a great variety of conditions 10, 20, 30 and 40 yard shots on full body deer targets as well as paper. And, each of these archery hunters will most likely have a separate sight pin for each 10 yard increment. For those now reaching to the trajectory differences of a heavy arrow shot over short range compared to a 180 grain bullet over 300 yards put that argument away as both conditions have sufficient trajectory drop greater than the vertical size of the vital clean harvest zone of a deer profile. Add that trajectory variable to less than accurate range estimation and together the unknown result can easily mean a missed shot. And, it does. One of our most common deer hunting stories we get. Always good to remind folks we do not promote ourselves as a trophy whitetail organization. We are folks who work towards good hunt execution to whatever level any hunter aspires to. What it all means is…. 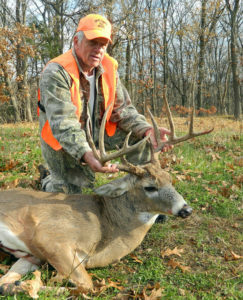 While many believe firearms hunting equates to the easiest method by which to harvest observed trophy whitetails. Reality is our years of experience is to the contrary. For those planning Deer firearms hunting. They are best advised to stick to a shooting distance they have the most experience with. Typically 100 yards or less. Or, get to shooting ranges that extend to 300 yards and use many paper full body deer targets. A far better perspective is developed when seeing just how small a deer silhouette is at 300 yards to that of 50. Yes, maybe. Motivation to hit the long distance shooting range, we hope so.